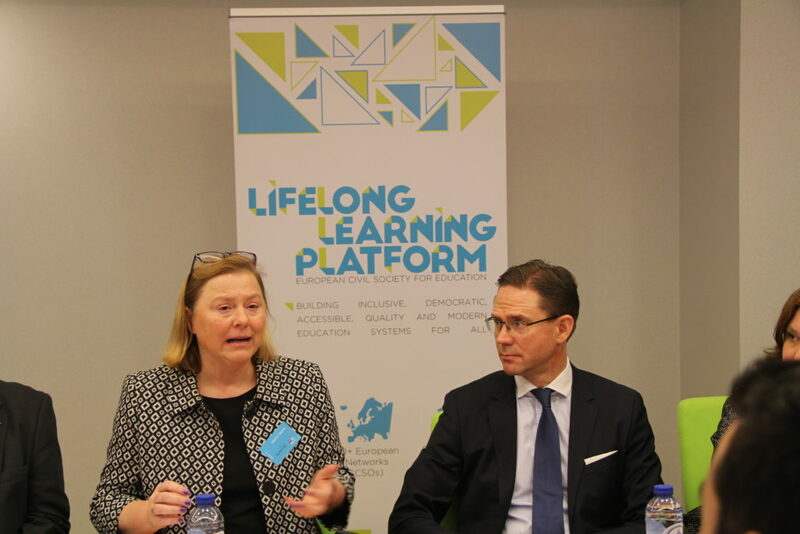 The third meeting of the Lifelong Learning Interest Group of the European Parliament in 2018 took place on 4 December as part of the 2018 Lifelong Learning Week. Organised by the Lifelong Learning Platform (LLLP) and the European Association for the Education of Adults (EAEA), the meeting gave the opportunity to Members of the European Parliament, representatives of civil society and stakeholders from all sectors of education and training to discuss the topic of Investing in education and lifelong learning – how can the next MFF support Europe’s learners?, together with Mr Jyrki Katainen, European Commission Vice President for Jobs, Growth, Investment and Competitiveness. The focus of the meeting was on how the next EU Multiannual Financial Framework (MFF) can be an opportunity to strengthen accessibility and quality in education, training and lifelong learning, through the flagship Erasmus+ programme, but also through synergies with other programmes with a learning dimension such as Horizon Europe and the European Social Fund+ (ESF+). Speakers stressed the importance given to education in the Gothenburg Social Summit last November and the prospect of a European Education Area by 2025 as recognition of education’s crucial role in shaping the future of Europe. MEP Jill Evans, shadow rapporteur for the CULT Committee’s report on Erasmus+, highlighted the importance of Erasmus+ in supporting the transition of young people from education to adulthood. She emphasised its impact on employability and the promotion of active citizenship, in particular participation in European elections. Confirming the ambition of tripling the budget, she underlined the need for the new programme to be more inclusive, supporting organisations working with marginalised groups. Regular review of financial support to meet the real needs of students, and support of language learning, including language minorities, were also key points. MEP Emilian Pavel shared his confidence in a positive approach towards Erasmus+ in the EP, as evidenced by the almost unanimous vote on the EMPL Committee’s Opinion for which he is rapporteur. He said VET and lifelong learning should have a crucial role in the future programme and emphasised that not only Erasmus+, but also other programmes such as ESF+, should be strengthened. He recalled that lifelong learning is a priority of the European Pillar of Social Rights, which underpins the EP’s interim report on the next MFF. Vice-President Katainen highlighted that the next MFF would have the highest ever share of investment in human capital, vital for enhancing people’s resilience in the face of rapid technological changes: “We need to build the resilience of individuals in society. But it is hard to imagine how to do that without improving the quality of education at all levels,” he underlined. In addition to the important role of Erasmus+, which he hopes in the next programme period will benefit more VET learners and teachers, he referred to the strong social investments that the proposed InvestEU programme will promote, as well as synergies between ESF+ and Erasmus+ for supporting disadvantaged groups. Such synergies are a priority: “I agree that breaking down silos between programmes and policy areas is of primary importance – this is crucial to ensure that they are harnessed in the best way to meet their objectives”, he stated. Cooperation across sectors and programmes was also emphasised by Gina Ebner, President of LLLP and Secretary General of EAEA: “Learning throughout life requires more and more complex connections, as we take on different roles: citizens, consumers, parents, or volunteers,” said Ms Ebner, calling not only for a lifelong learning approach in Erasmus+, but also on linking different sectors to education, such as agriculture or health. Looking at the opportunities given by the MFF, she underlined that they could help with alleviating inequalities, reaching out to disadvantaged learners, promoting democracy and values, but also addressing inequalities within countries, and within the lifelong learning sector itself, where some sectors get more funding than others. Overall, speakers and participants agreed on the value of investing in people through high-quality education, training and lifelong learning in order to reduce social inequalities, promote upskilling and tackle negative anti-democratic forces. A key message was that contacts between people and organisations and across various education sectors, made possible by Erasmus+ and other funding programmes, should be further supported in the next EU budget. LLLP and its members shall continue to advocate for this as the political negotiations continue.